The day that Master gave Her lecture in the Netherlands just happened to be Mother's day. She offered Her congratulations and all the flowers She had been given before to the mothers in the hall. The main points of Master's lecture stressed that "Once we know the grace of God, life begins to change, life begins to be the way it should be, life begins to be like Heaven." While answering questions after Her talk, Master told us a little story about Her time with a Muslim taxi driver. When She closed Her eyes and meditated, the driver asked Her, "Are you sleeping?" and Master answered, "No, no, I am praying, I pray five or six times a day." The driver said: "But if you pray, you must go to a mosque, you must do this and that." Master said, "No, our prayer is simple. I have a mini mosque I carry in my handbag. Our method is very convenient." 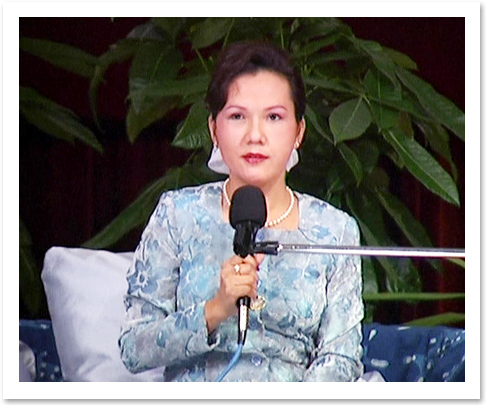 Someone asked Master whether She expected the future coming of Christ, as many people do. Master answered: "No, I don't. I know He came already. 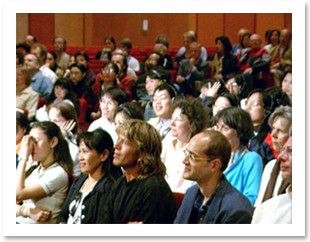 [Audience gave a warm round of applause] Master continued: "The Jews asked the same question when Jesus was alive. They were waiting for the Messiah and killed the one that had already come. Don't do the same again." While answering a question about what Master thinks of angels, Master said: "Angels are my friends. The Father sent them to help me. They do anything I want, and are very helpful people. And after you are initiated, I also ask to supply some more angels for you, personal assistance, at least five for each." Master gave many people advice about life: "Only enlightenment will make you happy without having any more desires, will make you understand everything, and will loosen your attachment to all kinds of things." After Master's lively, loving and wise lecture, many people determined that they would get initiation and walk the way Master has shown us. These new torches have now been illuminated and will make our world brighter.